The road's been closed a long time on Highway 144 in Sycamore Canyon. Is it a safety hazard for fires? Remember Chainsaw Don Miller, the Montecito live-action activist who, last month, cut Caltrans loose from a rhetorical knot tying up a State Highway 192 pedestrian access path? To get the conversation out of stall-mode, Miller grabbed his chainsaw and mowed down two full blocks of offending shrubs on 192. His deed drew decision-makers from Montecito to San Luis Obispo rushing to see his handiwork and, subsequently, rushing to address his concerns about safe walking routes to school. This month, after watching South Lake Tahoe and Griffith Park burn, Now-that-I-have-Your-Attention-Miller is on fire about Montecito’s wildfire evacuation plan. With dryer-than-ever conditions and a locked gate on Highway 144 in Sycamore Canyon, potentially blocking Montecito’s emergency exit, Miller thinks the community should be discussing fire preparedness and planning for evacuation. With that idea seared in his mind, Miller burned a path to Montecito Association President Bill Palladini. "Chainsaw" Don Miller is turning his concerns to wildfire management and evacuation in Montecito. Palladini took Miller’s comments to heart, torching the previous agenda, and adding a fire evacuation to Thursday’s semi-annual homeowner association roundtable discussion. The meeting, open to the public, starts on June 28 at 6 p.m. in Montecito Hall, 1469 East Valley Road. Palladini promised to have Supervisor Salud Carbajal and Montecito Fire District Chief Kevin Wallace on hand to review emergency preparedness. Highway 144, better known here as the Santa Barbara end of Sycamore Canyon, is partially blocked because of a two-year-old landslide. 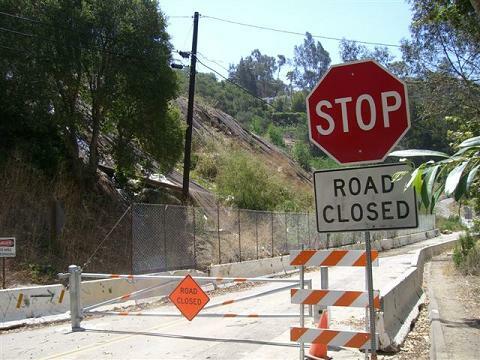 Since the massive slide, Caltrans and the neighbors have been in negotiations over the methodology, risks, and authority of a hillside stabilization project. An agreement was reached last March and work will begin soon, with neighbors in command of the $50 million earth-halt project. 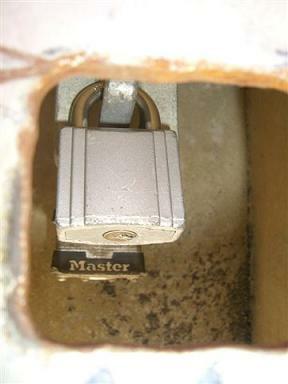 The lock on the Sycamore Canyon-Highway 144 gate. However, until stabilization is complete, Highway 144 remains closed, blocked by the slide and a locked gate due to the lingering fear that traffic vibrations might cause further damage. It’s the nearly impervious gate, in Miller’s opinion, that poses a disaster-threat. However MFD’s Chief Wallace disagrees, saying the fire district is well aware of the exit blockade and has a wildfire exit plan in place. SPEAKING OF FIRE PREPPING: What’s the plan? Are you prepared for a wildfire, or are you stuck like a doe in headlights, stopped in your tracks by the overwhelming nature of trying to organize for disaster? To easy your fear and help you ignite into action, Montecito Emergency Response and Recovery Action Group (MERRAG) has been distributing weekly email disaster preparedness tips and a “Get Prepared” action plan. These tips are great for any procrastinator who lives in a fire prone part in Santa Barbara County, or in California, or the world for that matter. The tips are really that universal and that helpful! To date, topics have included how to prepare a “Go Kit” and how to be fire weather wise. Just witnessing the hasty retreat South Lake Tahoe residents were recently forced to make should be enough to inspire anyone to get prepared. If you’re still on the fence, remember the previous MFD warning: It’s not if there will be a wildfire in Montecito, it’s when! Don’t get caught out in the cold, get on the MERRAG hot disaster preparedness email tip list, contact Geri Simmons Ventura at gsimmons@montecitofire.com or call 969-2537. ANOTHER FIRE DOUSED: This week, architect Bob Easton may have thrown a wet blanket on a proposed Montecito mansion that was starting to ignite some substantial citizen controversy. The hot-button issue was triggered by a project proposed by Easton’s client, Robert Largura, to develop a single family residence at 2489 Bella Vista. The building pad is located in Montecito’s environmentally sensitive foothills, overlooking Romero Canyon Trail. The serene foothills of Montecito will always be a topic of development debate. Starting in the spring of 2006, the Largura project has undergone several MBAR reviews, and received a staff denial because of land use policy inconsistencies. 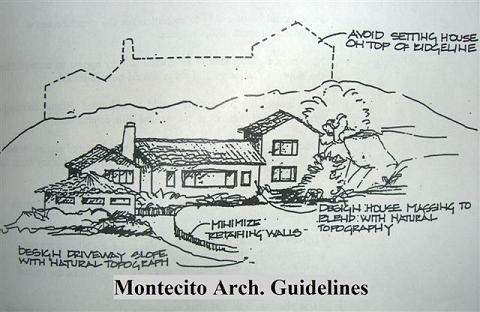 In January 2007, the Montecito Planning Commission upheld an appeal of the denial. On June 18, Easton proposed a revised project, but the neighbor’s reaction remained unfavorable, and MBAR requested that the story poles be put up prior to next week’s July 2 MBAR meeting. This week, when Montage called to see when the story poles would go up, Easton said they are not going to put up story poles because, by the July 2 MBAR meeting, the project will be substantially revised and trimmed down. Easton said intends to present the MBAR with a model showing an abridged plan for the property. The formerly proposed 5,000 square foot, two-story residence will be reduced to a 4,200 square foot, one-story house, further tucked into the hillside to prevent vista disfiguring. Easton was faced with the problem that the Bella Vista site is located in an area protected under Montecito’s Resources Management zoning. 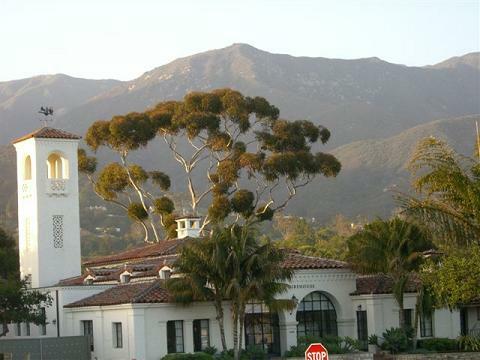 Joan Wells, a former planning commissioner and one of the authors of the Montecito Community Plan, said the zoning was intended to protect land unsuited for residential development and to limit development due to the presence of fire hazards and/or environmental constraints. “A lot of the foothills are in private ownership. 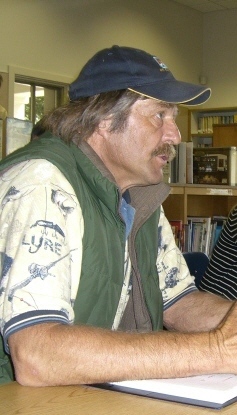 Even lands that are in the national forest are in private hands,” explained Wells. “The potential to develop is there and it is one of the reasons the Montecito Community Plan included a hillside ordinance. We tried to be sure Montecito’s hillsides are protected.” With a revised Largura project perhaps putting the hillside building issue at bay for the moment, community members do not think the issue is buried for good. Montage hears the new Easton plan may still not have found neighborhood harmony and may not completely align with Montecito’s tough Resource Management zoning. We hear the basement size has increased and negative grading issues could come into play. It’s a sure bet, even if this project flies, that hillside development will continue to be a much debated Montecito land use topic. And this particular fire is far from out, so look for the flames to be stoked once again at the July 2 MBAR meeting. The item comes up first on the agenda. ON-FIRE WRITERS: As I come to the end of this column, I am most poignantly reminded of the adage, “If someone says they love to write, they must never have written!” That said, there is a full conference of writers who really do love to write, and this week they have taken over Fess Parker’s DoubleTree Inn to share trials, tribulations, and trade secrets. Selden Edwards celebrates his 30-years-in-the-making major book deal with his wife Gaby at the Santa Barbara Writers Conference. 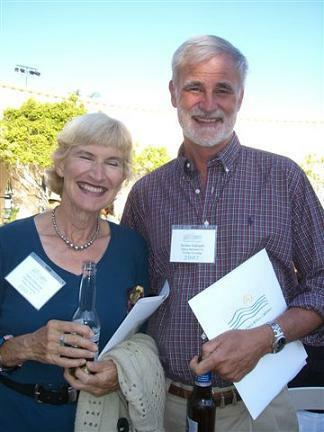 The 35th Annual Santa Barbara Writers Conference got under way last Friday under the direction of executive director Marcia Meier and the ever-watchful eyes of founders Barnaby and Mary Conrad. Headliners include Ray Bradbury, Carolyn See, Fanny Flagg, Gail Tsukiyama, Agent Jeff Herman, Novelist J. F. Freedman, Shelly Lowenkopf, Gayle Lynds, and Christopher Moore, to name but a few. Montage’s most inspiring yarn came from Selden Edwards, who has persistently been working on a novel for 30 years. After too many rejections to count, Selden finally got a New York agent to take a peek at his tome, and within nine days the book sold in a “major” deal, and movie rights are in the works. The moral of the story is that it’s all about who you know. And that’s where the Santa Barbara Writers Conference comes in: If you love writing, you’ll meet the people who count, and can be counted on. It continues throughout this remainder of this week and the public can get tickets to the evening lectures by going here. VACATION FOR MONTAGE: Next Wednesday is Independence Day and a very independent Montage will be focused on lighting a few firecrackers, so no Montage next week. We’ll be back July 11 with a column full of sparklers, blasts, and explosions! Happy Fourth!